These two countries’ troubles over the summer sparked fears that the contagion could spread, and that foreign investors might start pulling capital from emerging markets (EMs) more broadly. It turns out that investors had been building up exposure rather quickly in 2017 and the first part of 2018. Synchronized global growth and all. The chart below shows inflows through the second quarter. Portfolio inflows into emerging economies were at secular highs in dollar terms, creating the potential for a significant reversal. In fact, for many countries, the Q2 2018 data hints that flows had started to reverse even before Turkey’s crisis intensified in August. This becomes clear if China, which is responsible for much of the recent rise in inflows, is taken out of the inflow chart. 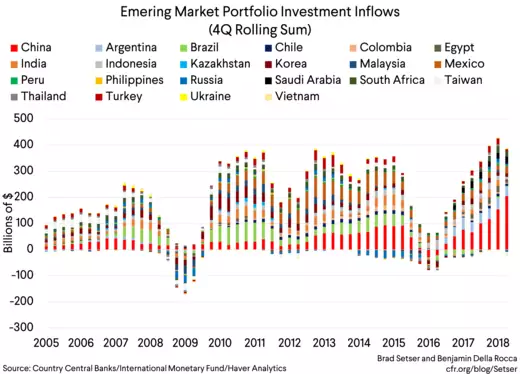 Inflows to other emerging markets look to be about $100 billion off their peak, though still well above their 2015 (oil price fall, China currency scare) lows. Another way of evaluating the risk posed by a potential reversal in portfolio flows is to compare the size of the inflows to the country’s need for financing, e.g. their current account deficit. 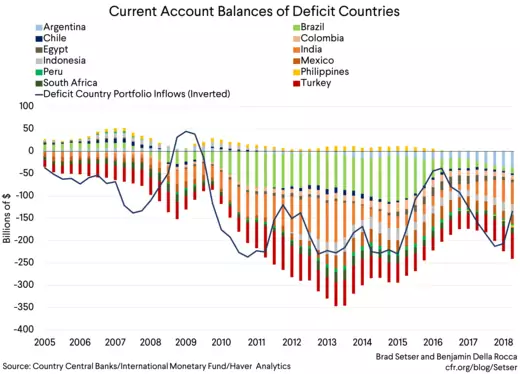 Going into the summer, the combined deficit of the “deficit” emerging economies was rising—largely because of increased deficits in Argentina, Turkey and India. (The overall emerging market deficit isn’t as large as in 2013, largely because Brazil has remained stuck in a deep recession and isn’t currently running a significant deficit.) Obviously, this deficit is now coming down; higher frequency indicators suggest Turkey is on the edge of swinging into a sustained surplus and Argentina’s deficit is shrinking rapidly. India will be helped going forward if oil sustains its recent fall. Looking back at portfolio flows over the past decade also can help benchmark the scale of the recent pull back. Since the financial crisis, as our first chart showed, there have been three periods when inflows dropped—in 2011, 2013, and 2015. The episode in 2011 proved fairly mild because, unlike today, the pullback from emerging markets fundamentally stemmed from growing uncertainty about the euro area, which led investors to cut portfolio risk globally—they sold riskier emerging market assets and poured into safe havens. 2013 was the year of the infamous “taper tantrum,” in which the prospect of higher developed-world rates, and a stronger U.S. dollar, made investors wary of emerging markets. By this time, some emerging markets were showing signs of macroeconomic vulnerability, notable relatively large external deficits. However, the pull-back proved short-lived; once the Fed pushed back its tightening timeline, inflows resumed. The 2015 episode—the largest pullback of the last decade—is the best benchmark for real stress. 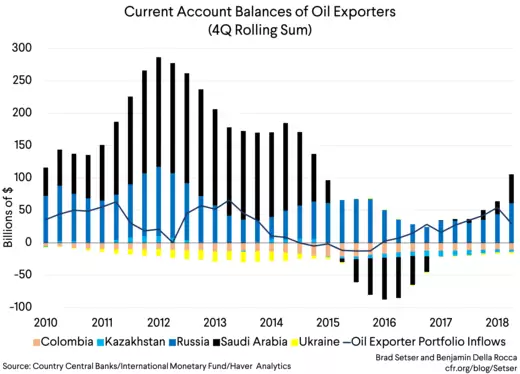 The fall in oil prices hit oil exporters hard, forcing them to adjust their external balances—as we show below. Portfolio inflows were pro-cyclical; they fell along with the price of oil (thanks in part to U.S. sanctions on Russia) and then rebounded as prices rose off their lows. No doubt the Saudis’ willingness to step up their borrowing played an important role in the rebound too. The oil exporters have a larger underlying need to borrow than in the past. But the biggest swing in portfolio flows back in 2015 didn’t come from the oil exporters: it came from China. 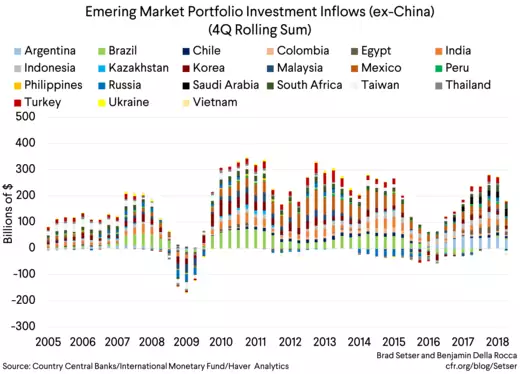 The drop in inflows into China accounted for about 40 percent of the reduction in EM inflows between Q2 and Q4 2015, as investors pulled back in the face of a falling stock market and rising currency risks. If there is a sharp pullback now, the reversal is likely to be centered around debt, rather than equities. Rising demand for emerging market debt drove the pickup in overall flows since the emerging market recovery started in 2016. But there is one critical difference: the recent inflow story is even more Sinocentric than in the past. China alone accounted for 50 percent of portfolio inflows into emerging economies in the four quarters to the middle of 2017. 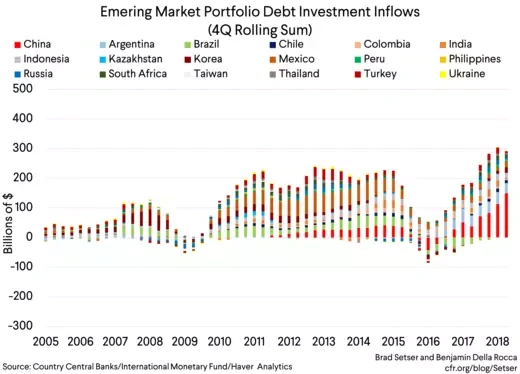 Actually the pickup in inflows was driven by both Argentina and China—collectively, they accounted for about two-thirds of the inflow into emerging market debt from mid 2016 to mid 2017. But there is no real doubt about what will happen to inflows into Argentina now—the IMF had to augment its program over the summer to cover the absence of private financing at an affordable price. The uncertainty is all around China. China’s economy is likely in somewhat better shape today than it was in 2014-2015. Back then, China’s policy tightening created a sharp slowdown in the real estate sector—and the yuan’s link to the dollar pulled China’s currency up at an inopportune time. We believe that growth then was far weaker than the official numbers suggest. Today, there is a risk that China’s efforts to rein in lending will slow growth more than Xi wants—and that the recent swing to policy loosening will come too late to revive the economy in 2018. But the biggest risk is clearly external: the “pause” on U.S. tariffs may not last, and if the U.S. escalates and raises its tariffs, there is a risk that the yuan could be allowed to fall further. So there is potential for a reversal of inflows into China in 2018. The buildup in investor exposure is certainly there. Chinese portfolio inflows have tripled between Q2 2017 and Q2 2018. But much of the current buildup likely came from central banks diversifying their reserves; it consequently is a bit different than the inflow into other emerging economies. *** The real risk looks to be that the current portfolio inflows into China could slow, creating a bit of additional pressure on China’s reserves—and adding to the risk that a swing in China’s yuan policy (it is still a heavily managed currency, and move in the yuan reflects a policy choice as much as market pressure) will trigger renewed pressure on other emerging economies. *The rollover rate on Turkey’s syndicated loans—judging from Turkey’s balance of payments data—was quite low in September. But one of the big loans that was paid in September was apparently renewed in October. This should be apparent in the October data. Markets have certainly stabilized after the CBRT raised rates. **Robin Brooks of the IIF has been tracking this data as well. But I don’t think he patented the technology! I used to watch this indicator back in my days in government service, it just took a bit to replicate it without the help of a small team. ***Circumstantial evidence suggests Russia moved a substantial share of its reserves into the yuan in Q2.